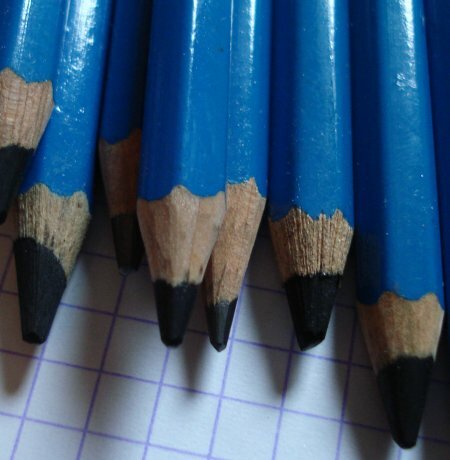 I notice in the photo one of the pencils is grade EE. 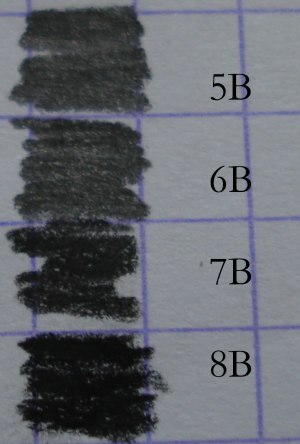 What is that – even darker than 8B? Regarding “bovine” fat, I believe the use of tallow is widespread, almost universal, in woodcase pencil manufacture. Well thats what one major manufacturer says. Hmm, I was wondering if anyone would notice that EE pencil. Good for you. An upcoming post will delve into this grade. I believe this particular EE is the same darkness as an 8B. And – wow, I did not know of tallow’s continued widespread use in pencils. I’m aware that tallow is probably used in innumerable industrial products, but never thought that this might include pencils. The use of tallow might be a good qustion for someone like Woodchuck – Timberlines. kiwi-d, Staedtler mentions in this 2002 PDF that thin lead pencils use cellulose-based polymers in place of clay. Yeah, the leads in woodcase pencils and the “thin leads” in mechanical pencils are substantially different beasts. I understand tallow is generally not used in MP leads, its replaced by “oil”. But then again, who knows where this oil came from – might not have originated from an oil well. Could be compressed distilled baby rabbits for all I know. I have a tin set for Staedtler which has 6 different grades including 8B and 7B. I noticed the difference in composition for 8B and 7B as well, and I’m almost quite certain that these two grades have a significant amount of charcoal to make the lead quite dark in comparison to the graphite-based grades. For some reason, I felt a little let down upon realizing this since I expected they’d be graphite, not some charcoal-clay-graphite mixture (though maybe they’re just charcoal, period). It is possible to have a softer grade in graphite since I have a Faber-Castell PITT Graphite Pure 2900 9B (woodless pencil) leftover from a college art class. Actually, the Mars Lumograph 7B and 8B are rather different from other manufacturer’s 7B and 8B. It’s pitch black. Derwent Graphic’s and Faber-Castell’s (I don’t remember exactly which of the FC-pencil variants though, but a green drawing-oriented sort) 7- and 8B leads are much shinier, glossier, more grey than the leads found in the Mars Lumograph, which is why I prefer the Lumograph – it can be used to draw perfectly black areas and extremely dark portions on greyscale drawings, without becoming uncomfortably shiny. Otherwise, I usually prefer Derwent pencils, but for graphite works I’ve stuck with the Lumograph for quite some time now, mostly because they’re so much more matte than the competitors. The lead of the Lumograph 7B and 8B contain soot that makes for that – as you put it aptly – “pitch black”. Does anyone know what “E” and “EE” are abbreviations for? “E” stands for “Extra” so “EB” means “Extra Black” and “EE” (also “EEB” and “ExExB”) means “Extra Extra Black”. Derwent now have a 9B pencil, but I hear that their Onyx blackleads are even darker and they’re not a charcoal pencil….